Suggestions taken? Sell units separately. I would double up on wine glass holders instead of vertical bottle storage. BEST ANSWER: The Modular Cork Catcher System is a new item for Wine Enthusiast. Thank you for the feedback and I will forward your suggestion to our merchandising department. Can I purchase the units separately? BEST ANSWER: The Modular Cork Catcher System is sold as a set and is comprised of 5 pieces; 1 cork catcher, 1 vertical bottle storage, 1 horizontal bottle storage, 1 hanging glassware rack and one combo cork catcher/horizontal bottle storage. I believe you can. We ordered two to fit our wall. We have received many compliments from friends. Sturdy construction. That would be great. But I thought you had to purchase the unit which consists of 4 pieces. What is the packaging size and weight? BEST ANSWER: I would also like to know this question above. East Europe shipping for the item? So do you need two sets to make it look like the advertisement? BEST ANSWER: Yes, however I bought a single unit as a gift and we were both very pleased with the final look. The image provided is a little misleading as it's not immediately apparent that two units are required for the exact look. Yes, this picture shows two sets. I personally bought one set and they look just as nice on the space on my wall. Yes, two sets to match the picture. And there are 6 parts to each set, not a row of 3. Yes you do need two sets to match the picture. I only have 35" height; I was wondering if we could detach the top wine holder storage piece? BEST ANSWER: Sue, I purchased this a few months ago and love it! It comes in five separate pieces, the largest piece is the one in the middle next to the wine glasses. (the one with the largest cork holder). If you look closely at the picture each piece has to be screwed in separately so you can put them on the wall like you want! Hope this helps. The Modular Cork Catcher System can be put together in anyway that best works for you. Each piece can fit with each of the other pieces so you can customize the way you set it up. I wouldn't make adjustments to any of the components. You can arrange in any combo as you like. You do not need to go so high as if you want to go length wise. Just take note of the that there is one square of a cork holder / horizontal wine bottle holder that can not be separated. We arranged the modules horizontally so it is 24” high by 36” wide. When will you let me order these individually? 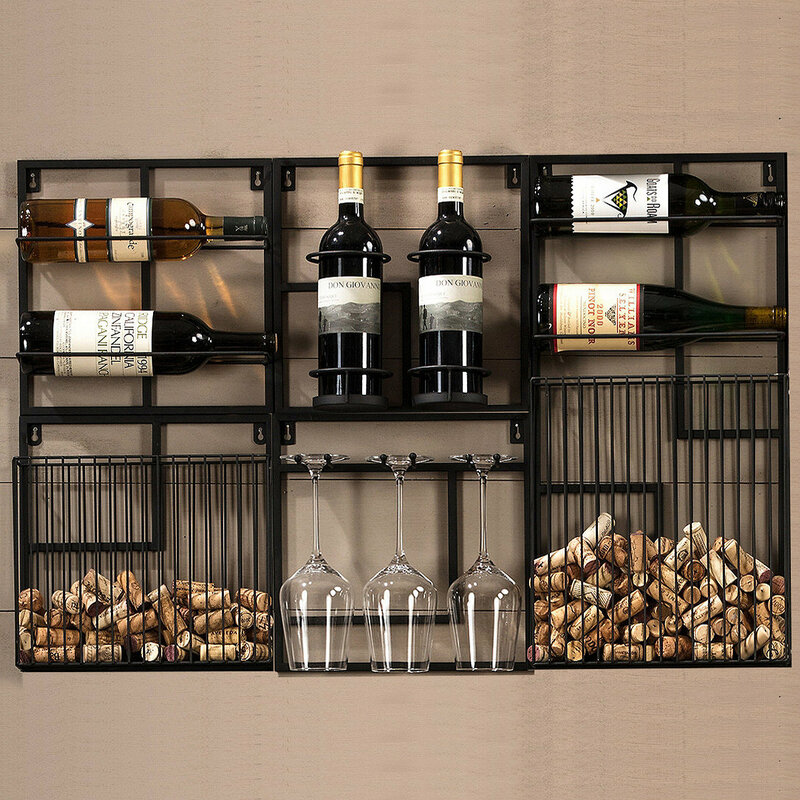 I want the cork catcher/horizontal bottle piece, two wine glass holders, and 2 horizontal bottle holders to do a 3(wide)x2(tall) wall design. BEST ANSWER: Hi. Image as shown are two pieces. You are able to order these items individually. They are all separate pieces and can be configured however you would like. This is a question for the company, not for a customer. How do you holder individually? Do you ship to Ontario Canada? BEST ANSWER: Sandy, We do ship international via UPS. If you would like a quote for shipping to your address please reach out to Customer Service at 800-356-8466. Please keep in mind UPS international rates can get costly especially on larger items. do you have the modular cork system available in 36" wide X 24" tall? just the opposite of how it is shown? BEST ANSWER: Brn-Brn, They system comes in 5 separate pieces that can be arranged in any way. So you could re-arrange them in a horizontal orientation as apposed to vertical how we show it. Would you please arrange it that way and send me a picture? Unfortunately I do not have access the this product as my office is not close to our main warehouse. I was able to edit one of our existing photos to give you a better idea of what this would look like in a horizontal configuration. The diagram leads me to believe that the components (5), can be arranged in any pattern on a wall, not just vertically, as the catalog picture shows. BEST ANSWER: The Modular Cork Catcher System can be arranged in any way which works for you. Get creative! Do you ship this to Argentina? What material is this modular system? Is it wrought iron? How much weight is each modular piece able to hold? BEST ANSWER: The Modular Cork Catcher System is made from a light metal and each piece is designed to store different items, such as two bottles of wine, corks or even glasses. as two bottles of 750ml wine weigh 7lbs, I would use that as your guide. Love it! We displayed our favorite wines and instead of both baskets holding corks we put our wine magazines in one. I would recommend this item as it is different than anything we have seen! Excellent Item. Read the details. This is a very nice product and it fit my needs perfectly. If you need some various levels of storage, or storage and decoration this is spot on. I give it a 5 *.Now, here is a heads up. In the copy it describes the purchase as5 PIECES. Pay careful attention to this, as there are 5 pieces to each of the two sides shown in the brochure. If you don't have good skills with a level and both the top and the sides, give this careful thought. It isn't easy to hang or line up. BUT once done, it is very nice. Cons: 5 individual pieces = 10 holes in the wall. It would be nice to be able to attach the components together and hang as 1 unit. Love the system but one wine holder was bent and we had to go out and purchase different (for a better description) screw supports so the unit would hold securely to the wall. After it was on the wall -LOVE IT!! 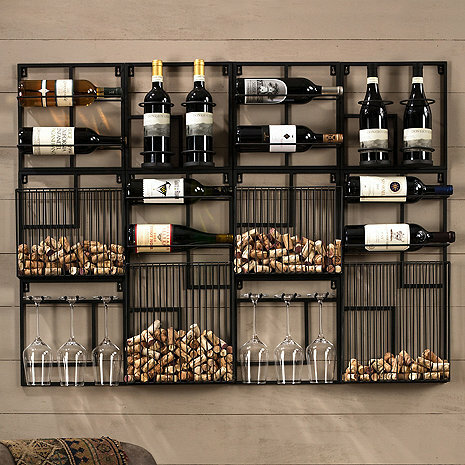 Love the wine rack, looks great on my wall. Love that it holds bottles, corks & glasses. Very difficult to hang. I guess we didn't understand what the word "modular" meant. We were thinking it came in one piece, but we were very wrong. Had to lay it out on the floor first and glue all the pieces together, just to make sure it hung straight on the wall. Definitely not worth what we paid for it. We love the system, except that we would have liked to have purchased each component, separately, for a more "custom" look. Otherwise, it's wonderful, fun, makes our dining room. All our guests love it too. Well worth the $ and time to put it up. Great way to display your favorite wines, we have bottles from winers we have visited. I was looking for something functional and fun for my wall to hold wine and store corks. This was easy to install and is sturdy enough to hold several bottles of wine (see note below). One note, I did have to use different mounting mollies and screws because the ones provided did not hold in the wall. Looks great! It’s a bit challenging to assemble and hang all the pieces, but it looks fantastic. We would have given it a 5 if we could have purchased the pieces individually!! It was very difficult to put together, but once we finished putting it up, it looked just like the picture. It’s really good quality and I’m very Happy with the come out looking . It’s fit my dining room perfectly . The Modular Cork Catcher is a perfect fit to finish a wall area which needed attention. We divided each section and displayed them among other items to complete the display. Worked out perfectly. Mod wine rack is awesome! Love it! The only constructive criticism is with every single piece being separate there were several pieces that didn’t align up which sets it off and not level/even. Otherwise looks great and can’t wait to fill it! While shopping for my wife for Christmas I came across this and knew right away it was the perfect gift. Well I purchased 2 as it was a great deal. I did not realize how big two units were. After putting up the first set of holders we found that two were too much in our dining room. Otherwise it was a great gift she loves. Will take her a while too fill all these cork catchers but what a conversation piece. Very cool. I absolutely love my modular wine rack/ cork collector! I ordered two as pictured on the site. It's such a statement piece on my wall! The modular design gives it a modern feel then the metal gives it an industrial yet rustic feel! Yes, all that in one! More than I hopes for! Excellent quality. Easy installation. Looks great. Functional. Love it. Love that the wall unit can be arranged the way that fits best on our wall. Wish you would sell individual pieces so we could add to the unit without buying an entire new unit. This would also allow us to mix-n-match individual pieces for a unique arrangement. Very nice piece although the picture actually shows two of them put together. Easy to hang up I'm definitely a conversational piece. I ordered two of these systems and they are a big conversation piece. None of my friends or acquaintances have seen anything like it. Love it. I love the Cork Wine Catcher. It is such a unique item and I have received many compliments. Thanks Wine Enthusiasts for always providing unique and fun accessories for my wine decor. Compliments the wall perfectly. So happy I choose this item. The wine bottles - corks and glasses look amazing. I love it. It is exactly what I was looking for. Our guests all compliment on how they like. Each unit comes in 5 components that must be hung independently. Problem is that due to manufacturing variances (not perfectly square, length of assembled pieces, wine cork racks wider than frames) it is difficult/impossible to hang them perfectly as shown in the picture. The reality is that it looks good and is a fun piece once it is hung. Even with the minor gaps an imperfect manufacturing, I doubt anyone will ever notice. Yes, I bought TWO anyway because they were exactly what the wall space needed. The quality is great, I just think $300 is far too much for what’s pictured....but there’s nothing else like it anywhere that could find. Looks beautiful on the wall! The only downside is the mollies that come with this product are of very poor quality and I would not trust them. One of the units even came with different mollies than the other four units that were actually worse. I highly recommend purchasing some good quality screw-in mollies if mounting to drywall, I ended up replacing the mollies on the larger unit, so it could support the weight. Another recommendation, after deciding how you want each part of the unit arranged, use cardboard to make a template to help mark the holes, (there’s quite a few screws). I drew an outline of the entire product on the cardboard and marked the holes, then used a level to hang the cardboard on the wall and mark the screw positions. After that is is as simple as popping in the mollies, adding the screws and hanging each unit of the product. Some pieces slightly bent so you can see some gaps but otherwise looks great. Unique piece but I was expecting that "wow effect" that happened when I saw it in the pictures. Difficult assembly with too many wholes in the wall. Product is good, but not what the image shows. The picture on the front is 2 of these products put together. If you buy 1 you get half of whats in the image. Othe than that it seems to be a good product. I way to mount unit to wall. I like the look but one of the units did not have mounting brackets. Wrote and called them as well as emailed pictures but it has been two weeks with no response. Respect my request on unsubscribe to these email!